Today I awoke to a covering of white stuff that Fr. Bob at the Mountain called “bunny fluff.” Bob said that any snow that falls after April 1st is referred to as bunny fluff. It works for me. My ride over to Mass this morning was typical as I made my way down the Ischua Valley towards Olean, New York and then east on Route 446 to the Village of Cuba and then on Interstate 86 to Friendship, New York and then to Nile and Route 1 to Mt. Irenaeus. It’s a route I know well. The further south and east I got the less of the bunny fluff I saw. However, as I began the climb up to Mt. Irenaeus I encountered some of the most beautiful and surreal images of snow clinging to the branches of trees while the ground underneath was bare. 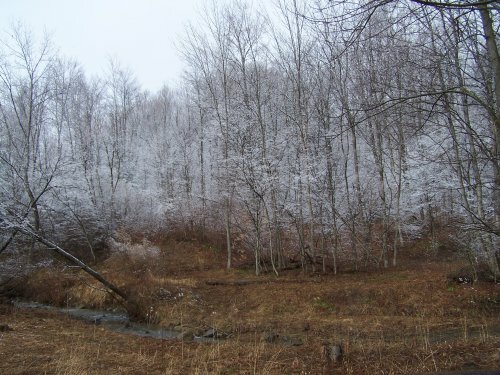 The wooded areas looked like powdered donuts. It was such a beautiful sight that I stopped the car, got out and took a couple of pictures. When it snows like this I’m reminded of God’s grace and how it covers everything. Snow and rain remind me of the Incarnation. Today that love was expressed on the trees along Hydetown Road as I made my way to Mass. It was a lovely sight and my picture does not really do justice to it. This entry was posted in Uncategorized and tagged Christ, Franciscan, love, Mt. Irenaeus, St. Paul. Bookmark the permalink.